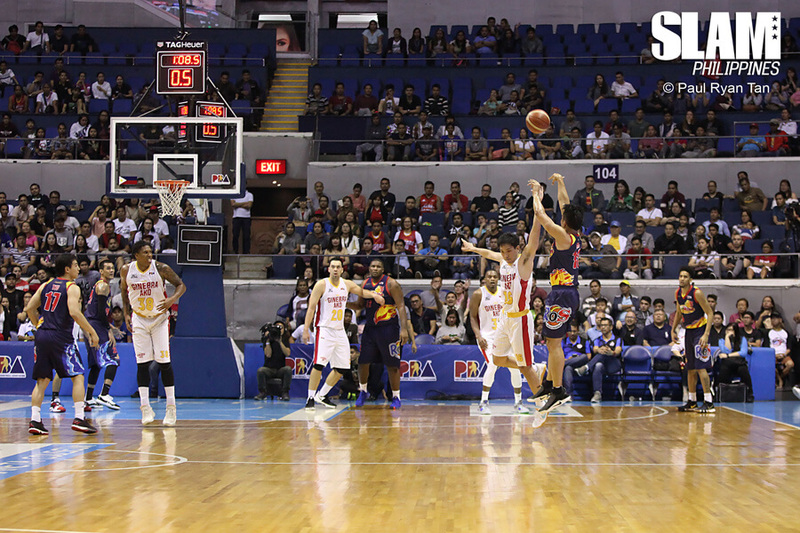 After all this time, James Yap is still pushing forward. Doubters wonder how he got this far, those who know, don’t need to wonder at all. Can he recreate the good old times? Is he the man he used to be? This, we’re sure of: he’s trying harder than ever. And yes, he wants more. Big Game isn’t over all the butterflies. No. Not yet. When I entered Rain or Shine’s practice facility, the players were already in the midst of their strengthening and conditioning exercises. All of them were lined up, diligently jogging back and forth while doing push-ups in between. It was quite warm inside the gym, but James Yap — clad in a relaxed mood and a pair of red sneaks — seemed unfazed by the heat. Sweat beaded the players’ bodies like flies on meat cuts at a market, but #18 looked all cool and collected. After a few whistles from their trainer, the team was broken into threes: James was grouped with Beau Belga and Billy Ray Robles. The players eased into their offensive drills with Rain or Shine head coach Caloy Garcia studying every screen, roll and pivot. On their first try, James receives a pass from Belga at the top of the three-point line. He gathers, sets his feet and releases his first shot of the day. SWISH. In the second play, he gets the pass on the run, fakes a shot and glides by his defender. He palms the ball, takes off and unleashes his signature one-hander. SWISH. Big Game’s still got it. After the practice I approached Gabe Norwood who defended James in most of the drills. Gabe has been in the league for nine seasons, most of which were spent guarding opponents like James. Known as one of the league’s best defenders, he admitted James was always a tough assignment, especially during his early years in the league. 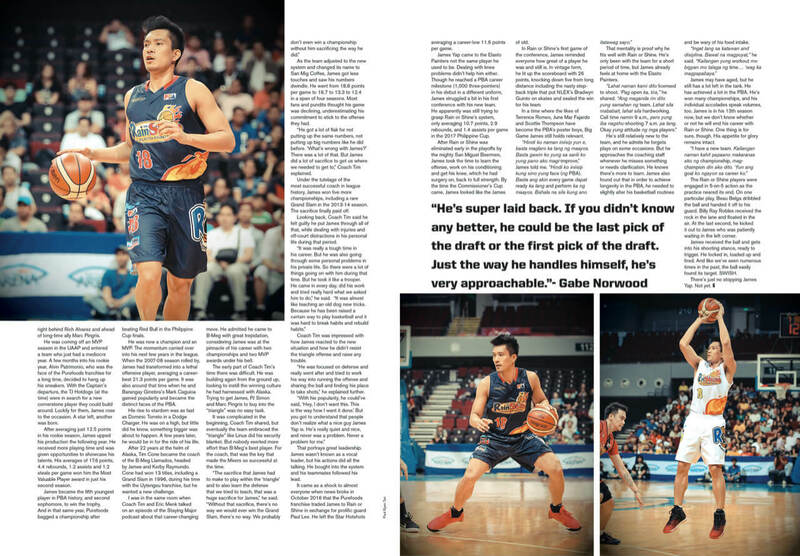 Now that they’re teammates at Rain or Shine, Gabe saw it as a sort of a reunion as they were on the same RP squad that finished eighth in the 2009 FIBA Asia Championship. It was also kind of a homecoming for James after enjoying success with the Welcoat Dragons in the now defunct Philippine Basketball League more than a decade ago. I looked at Gabe and saw a sense of happiness — and relief — as he talked about James, now a teammate. But more than the skills and his winning pedigree, its James’ personality that makes him fit right into Rain or Shine’s nonchalant culture. James entered the PBA in 2004, getting drafted by the Purefoods franchise as the second pick overall, right behind Rich Alvarez and ahead of long-time ally Marc Pingris. He was coming off an MVP season in the UAAP and entered a team who just had a mediocre year. A few months into his rookie year, Alvin Patrimonio, who was the face of the Purefoods franchise for a long time, decided to hang up his sneakers. With the Captain’s departure, the TJ Hotdogs (at the time) were in search for a new cornerstone player they could build around. Luckily for them, James rose to the occasion. A star left, another was born. After averaging just 12.5 points in his rookie season, James upped his production the following year. He received more playing time and was given opportunities to showcase his talents. His averages of 17.6 points, 4.4 rebounds, 1.2 assists and 1.2 steals per game won him the Most Valuable Player award in just his second season. James became the fifth youngest player in PBA history, and second sophomore, to win the trophy. And in that same year, Purefoods bagged a championship after beating Red Bull in the Philippine Cup finals. He was now a champion and an MVP. The momentum carried over into his next few years in the league. When the 2007-08 season rolled by, James had transformed into a lethal offensive player, averaging a career-best 21.3 points per game. It was also around that time when he and Barangay Ginebra’s Mark Caguioa gained popularity and became the distinct faces of the PBA. His rise to stardom was as fast as Dominic Torreto in a Dodge Charger. He was on a high, but little did he know, something bigger was about to happen. A few years later, he would be in for the ride of his life. After 22 years at the helm of Alaska, Tim Cone became the coach of the B-Meg Llamados, headed by James and Kerby Raymundo. Cone had won 13 titles, including a Grand Slam in 1996, during his time with the Uytengsu franchise, but he wanted a new challenge. I was in the same room when Coach Tim and Eric Menk talked on an episode of the Staying Major podcast about that career-changing move. He admitted he came to B-Meg with great trepidation, considering James was at the pinnacle of his career with two championships and two MVP awards under his belt. The early part of Coach Tim’s time there was difficult. He was building again from the ground up, looking to instill the winning culture he had harnessed with Alaska. Trying to get James, PJ Simon and Marc Pingris to buy into the “triangle” was no easy task. It was complicated in the beginning, Coach Tim shared, but eventually the team embraced the “triangle” like Linus did his security blanket. But nobody exerted more effort than B-Meg’s best player. For the coach, that was the key that made the Mixers so successful at the time. As the team adjusted to the new system and changed its name to San Mig Coffee, James got less touches and saw his numbers dwindle. He went from 18.8 points per game to 16.7 to 13.3 to 12.4 in a span of four seasons. Most fans and pundits thought his game was declining, underestimating his commitment to stick to the offense they had. “He got a lot of flak for not putting up the same numbers, not putting up big numbers like he did before. ‘What’s wrong with James?’ There was a lot of that. 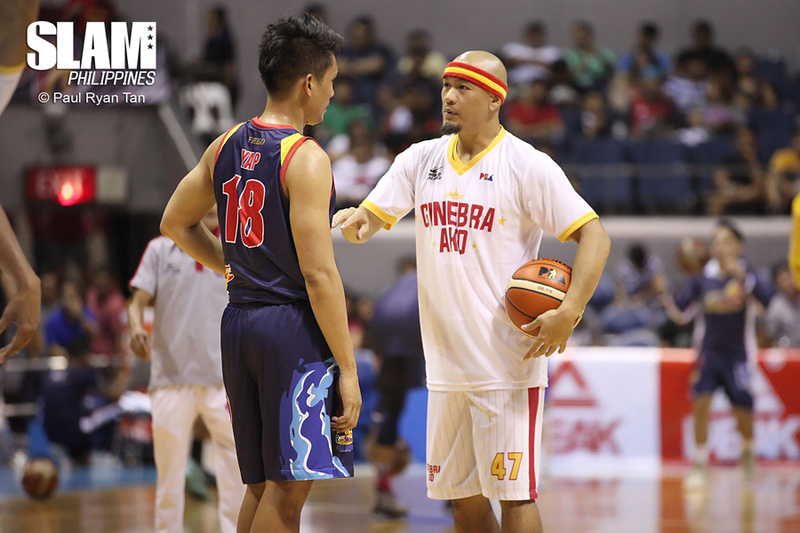 But James did a lot of sacrifice to get us where we needed to get to,” Coach Tim explained. Under the tutelage of the most successful coach in league history, James won five more championships, including a rare Grand Slam in the 2013-14 season. The sacrifice finally paid off. Looking back, Coach Tim said he felt guilty he put James through all of that, while dealing with injuries and off-court distractions in his personal life during that period. Coach Tim was impressed with how James reacted to the new situation and how he didn’t resist the triangle offense and raise any trouble. “He was focused on defense and really went after and tried to work his way into running the offense and sharing the ball and finding his place to take shots,” he explained further. That portrays great leadership. James wasn’t known as a vocal leader, but his actions did all the talking. He bought into the system and his teammates followed his lead. It came as a shock to almost everyone when news broke in October 2016 that the Purefoods franchise traded James to Rain or Shine in exchange for prolific guard Paul Lee. He left the Star Hotshots averaging a career-low 11.6 points per game. 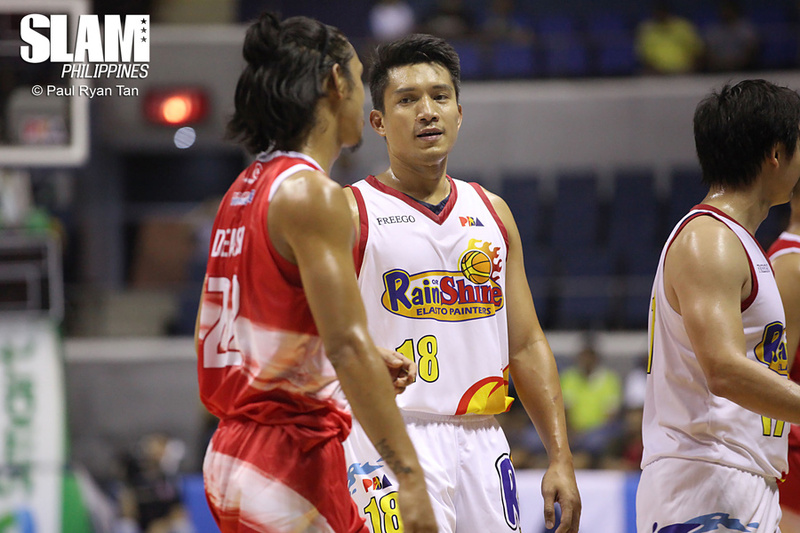 James Yap came to the Elasto Painters not the same player he used to be. Dealing with knee problems didn’t help him either. Though he reached a PBA career milestone (1,000 three-pointers) in his debut in a different uniform, James struggled a bit in his first conference with his new team. He apparently was still trying to grasp Rain or Shine’s system, only averaging 10.7 points, 2.9 rebounds, and 1.4 assists per game in the 2017 Philippine Cup. After Rain or Shine was eliminated early in the playoffs by the mighty San Miguel Beermen, James took the time to learn the offense, work on his conditioning and get his knee, which he had surgery on, back to full strength. By the time the Commissioner’s Cup came, James looked like the James of old. In Rain or Shine’s first game of the conference, James reminded everyone how great of a player he was and still is. In vintage form, he lit up the scoreboard with 26 points, knocking down five from long distance including the nasty step-back triple that put NLEX’s Bradwyn Guinto on skates and sealed the win for his team. In a time where the likes of Terrence Romeo, June Mar Fajardo and Scottie Thompson have become the PBA’s poster boys, Big Game James still holds relevant. That mentality is proof why he fits well with Rain or Shine. He’s only been with the team for a short period of time, but James already feels at home with the Elasto Painters. He’s still relatively new to the team, and he admits he forgets plays on some occasions. But he approaches the coaching staff whenever he misses something or needs clarification. He knows there’s more to learn. James also found out that in order to achieve longevity in the PBA, he needed to slightly alter his basketball routines and be wary of his food intake. James may have aged, but he still has a lot left in the tank. He has achieved a lot in the PBA. He’s won many championships, and his individual accolades speak volumes, too. James is in his 13th season now, but we don’t know whether or not he will end his career with Rain or Shine. One thing is for sure, though. His appetite for glory remains intact. The Rain or Shine players were engaged in 5-on-5 action as the practice neared its end. On one particular play, Beau Belga dribbled the ball and handed it off to his guard. Bill Ray Robles received the rock in the lane and floated in the air. At the last second, he kicked it out to James who was patiently waiting in the left corner. James received the ball and gets into his shooting stance, ready to trigger. He locked in, loaded up and fired. And like we’ve seen numerous times in the past, the ball easily found its target. SWISH. 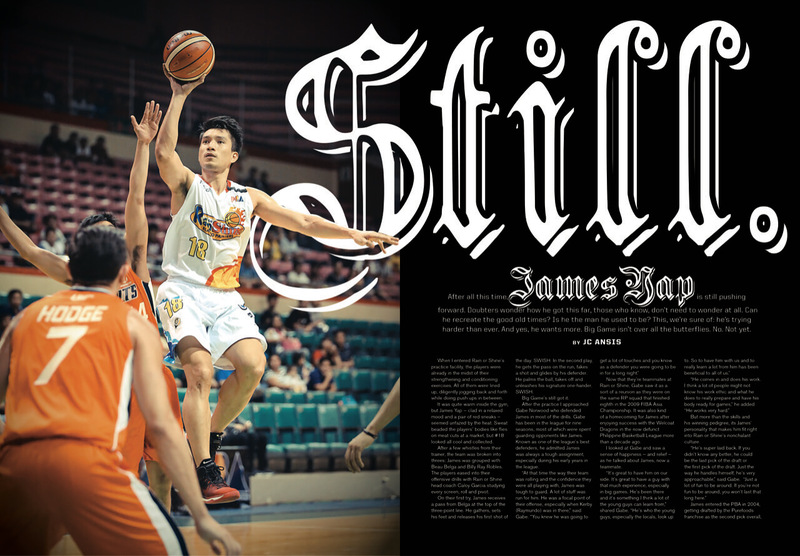 There’s just no stopping James Yap. Not yet.